On my recent trip to Bavaria, a small group of our wedding party went to nearby Innsbruck (Austria) for an afternoon trip. It was labour day though, and everything was shut, so we decided to visit the Swarovski headquarters instead. The setting of the factory admist hills and mountains could not have been prettier, and we were intruigued by the giant's head, build on top of a 'Tellytubbie land' like hillside, guarding it with his enormous crystal eyes. .. featuring crystaline art works by Salvador Dali, Keith Haring and Andy Warhol, installations by André Heller, sculputures by Alexander McQueen and Niki de Saint Phalle, sound worlds by Brian Eno and the largest cut crystal (300,000 karats) in the world. My favorite expo was the crystal dome, where you walk into a dome shaped room, made of 595 elements, and watch in wonder as they transform into every changing worlds, making you feel as if floating in space. 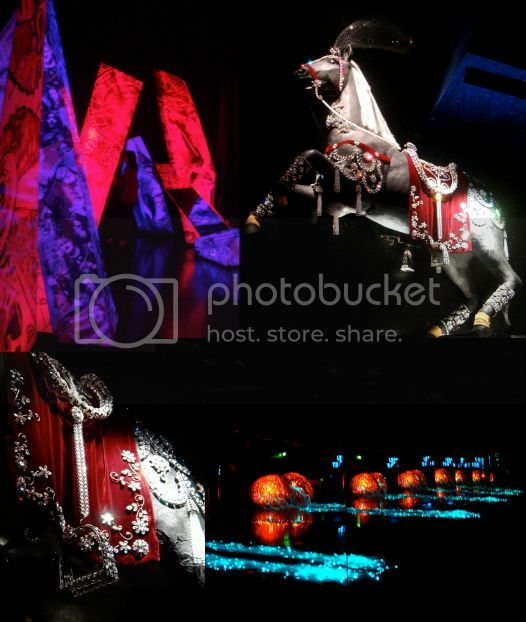 And of course there were amazing displays of fabulous Swarovski creations, sparkling in every corner. The settee below inviting visitors to relax in the retail space (their largest worldwide) was incredible smooth to the touch, even though the surface was made up completely by crystals. The Crystal World is open all year round, except for the 1st of January and the 2nd and 3rd week of November. And as by request from my dear readers, here is what I've been wearing at the wedding. Silk dress in pale aquamarine/cream, cream lace jacket embroidered with pearls and beads, shells and sequins, embroidered linen shoes and pearl earrings. I was curious as to what you were wearing, but didn't dare ask. It was a gorgeous outfit, Maitai! You look radiant. And the embroidered shoes...Love! I visited Innsbruck many years ago and the photos you posted brought back many memories of the beautiful scenery, although when I visited it was covered in snow! Your outfit is just beautiful. i especially love the shoes. They're so different and elegant. You look lovely Mai Tai! Merci for indulging us. It's the perfect wedding outfit. I have a pair of crimson embroidered slippers that I wear every Christmas Eve. What a beautiful jacket too. First I want to thank Scarf Enthusiast for writing out so nicely, what I was thinking also ;-) You look absolutely divine! 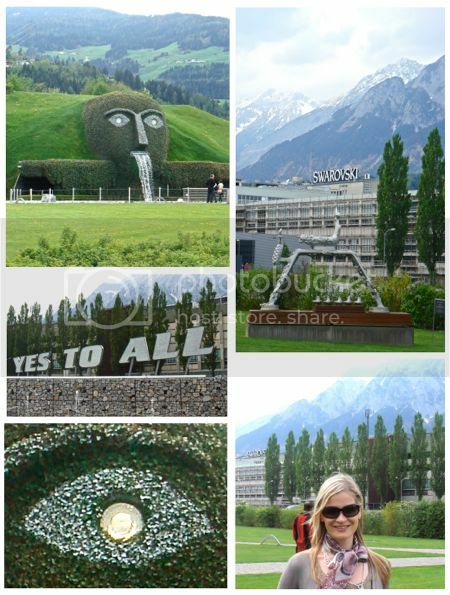 Thank you also for sharing those beautiful pics and the detailed information regarding the Swarovski crystal world. Have to get ready now, as the HFT and I are also invited to a wedding today :-). hugs to you, dear MaiTai, HM. I too love the shoes and appreciate Scarf Enthusiast's request for footwear shots!! Thank you as well for the fantasy photos of Swarovski's Crystal Worlds.... how touching that Alexander McQueen lives on through his sculpture there. 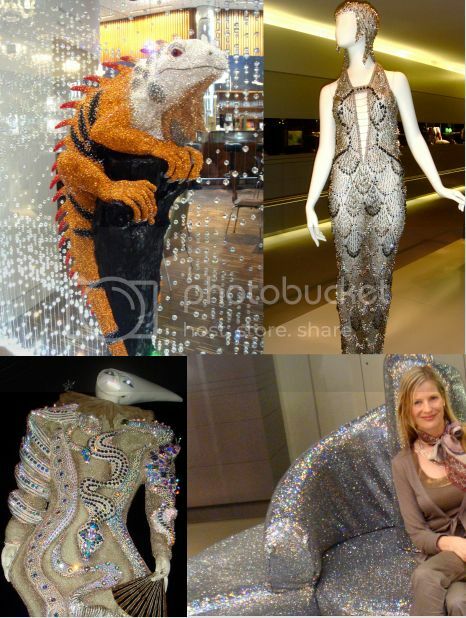 I went to the Swarovski factory 15 years ago and remember it as being sparkly and fabulous. While the displays are different now, your pics and post capture its essence as I remember; a wonderland for grownups! Thanks Maitai for making me smile and for sharing so much with all of us. I know my world is a little more sparkly and glamorous because of your blog. 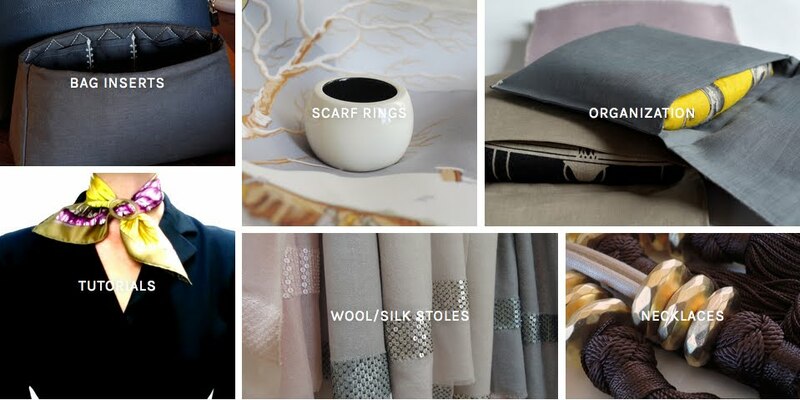 Esprit de la Vie, great to see you posting here, a warm welcome to you. I can just imagine how beautiful Innsbruck would be in winter..the skiing there must be simply fantastic too! Scarf Enthusiast, you are very welcome re the shoes, it actually was a superb idea, and something I have not thought of myself. Will try and post footwear pics more frequently. When DS saw me taking photos of the embroidered shoes, he looked at me as if I have lost my mind completely. I sometimes wonder how this shapes his view on woman, lol! SMR, I am with you re SE request, it truly adds another fun dimension to the capsules! I had the same sentiments as you re AMcQ’s sculpture, it was very special to have seen there a little part of the immense and rich legacy he left behind. Bkln Diva, oh how I love finding out to have crossed paths with my dear readers and friends, it is just so nice to have that extra connection. And a wonder world for grownups it definitely was! Your post made me smile, so thank you to you too. All I can say, MT, is that you must have outshone the bride. You truly looked lovely - perfect. You look gorgeous!! And the embroidered shoes are lovely =) I'm glad we got to meet last week, and am looking forward to Summer! MaiTai, you are very generous to take requests! How can your DS not form a wonderful image of women with you as his mother, who's beauty goes far beyond great sense of style and joie de vivre - huge kind heart, strength of confidence, multitudes of talents which you choose to share with the world, integrity in your work, pouring your heart into something you feel passionate about, true inner grace and beauty, shall I go on?.....And these are only a few of the things which I, and I'm sure many, have taken away from our exchanges on your beautiful blog. Thank you to hair-mess and SMR! I was in Innsbruck as a child... before the Svarovski museum existed; a visit is on my list of things to do with the family! I really adore the light and airy outfit you wore to the wedding. Perfect, down to the very last pearl drop! How fun to visit Swarovsky Crystals! Thanks for sharing those amazing pictures. And your wedding outfit is lovely! Oh Jerrine, the bride was so elegant and very JackieO like, you would have loved it! Have fun at the museum, dear dance, it's a wonderful trip for a family outing! I regret not having had 'my men' with me, I know they would have loved it too! I absolutely adore swarovski. One day I will love to visit austria and the crystal world.